PHILADELPHIA, PA – August 6, 2018 – Janney Montgomery Scott LLC (“Janney”), a leading full-service wealth management, financial services, and investment banking firm headquartered in Philadelphia, PA, today announced that it has moved its Columbus Grandview, Ohio branch office to a new location, conveniently located less than two miles from downtown Columbus. “We are excited to be moving our new Columbus branch office into the space at Grandview Yard,” said Doran Young, Complex Manager. “The space not only meets our employee needs today but is flexible for growth in the future. Janney continues to add talent to our financial advisory platform across our footprint and Columbus remains an important market to us.” Janney’s Columbus location opened in January 2018 with the addition of Scott Horowitz, Senior Vice President/Wealth Management and Branch Office Manager, and Shelly DeLucas, Senior Registered Private Client Associate. In March, the office welcomed Jeramy May, Senior Vice President / Wealth Management, and Kimberly Nelson-Velasquez, Private Client Assistant. 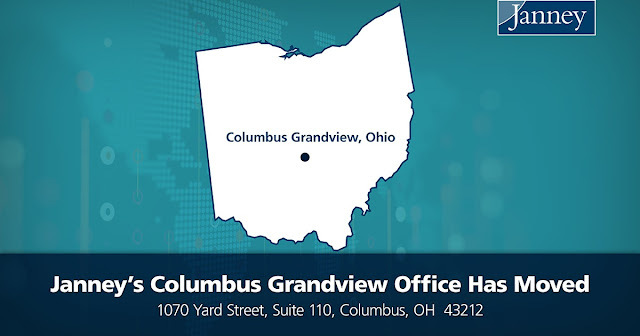 Janney’s Columbus Grandview office is located at 1070 Yard Street, Suite 110, Columbus, OH 43212.